Southern (California) Belle: Sourpuss Clothing Giveaway! I'm so excited to announce that I've teamed up with Sourpuss Clothing for an awesome giveaway! I'm sure you're familiar with the brand, but if not, they make the cutest dresses with the most amazing novelty prints. 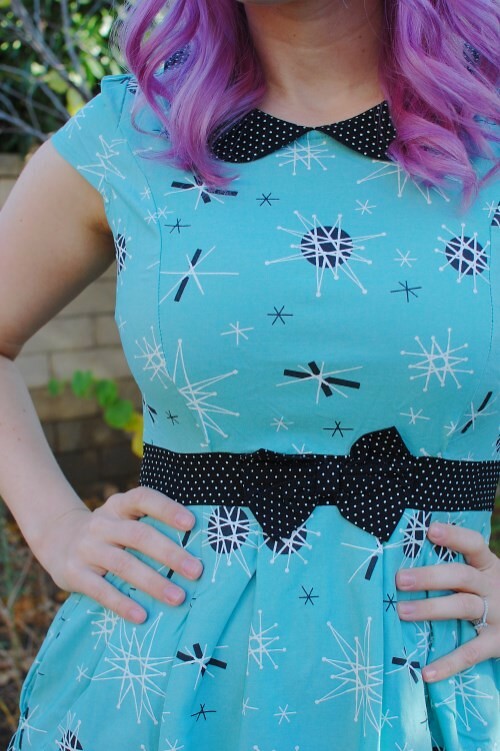 Sourpuss was gracious enough to let me pick a dress of my own and I couldn't wait to get my hands on the Lizzie dress in sputnik print. I love the cut of this dress. The cap sleeves are adorable and the Peter Pan collar gives it an extra girly flair. Of course, it has pockets and a bow detail on the waist so I knew right away this dress was for me. The fabric is stretchy and fully lined with a silky material. It also comes in a range of sizes, from S-2X. Basically, it's perfect. And guess what? You can have one too! You can enter this international giveaway after the jump! You have several ways to enter by using the Rafflecopter widget below. The giveaway is open internationally and will run until Wednesday, November 26th. Good luck!